Daniel 11:32 (NLT) “…the people who know their God will be strong and will resist him” This is referring to resisting the enemy. What are the attributes of God? These are his characteristics. They tell you who He is based on his character. This is not like the personality of man that changes based on the season or situation that we are going through. Ezekiel 11:5 (NIV) “Then the Spirit of the Lord came on me, and he told me to say: “This is what the Lord says: That is what you are saying, you leaders in Israel, but I know what is going through your mind. There is no cause for fearing that the petition of the righteous will not be heard. When you pray God hears because He knows all things. You will never be overlooked even though there are so many supplications going up to Him every minute. He pays attention to millions as if there is only one making supplication. God is Sovereign. Sovereignty means that He is over all things. Absolutely nothing is done that does not first go through Him. Joshua 10 – He commands the sun stands still. 1 Kings 17 – He commanded the ravens to feed Elijah by the brook. Isaiah 38 – He makes the shadow of the sun go backwards 10 steps, 2 Kings 6:5 – He makes the head of the ax float. In light of God’s Sovereignty, how does this change the way that you look at prayer? We know that He is in charge of everything. This is the God that we pray to. God is Immutable. His immutability means that He doesn’t change. God is perpetually the same. He cannot change for better or worse. He has no beginning and no ending to Him. How does it make you feel to know that God is Immutable? How will this change how you pray? Who could confide in a God that changes? How would we be able to trust Him? The permanence of His character guarantees the fulfillment of His promises. Why pray then? We pray because He requires us. Jesus prayed. “If we ask anything according to His will, He heareth us” (1 John 5:14). Anything contrary to His will is rebellion. 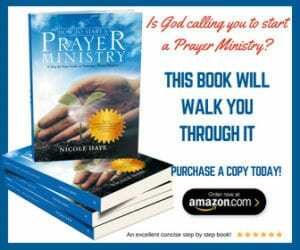 With a better understanding of who God is we can have a revitalized prayer life. We can enter in with a zeal we have not had before. Here is a prayer to revitalize your prayer life and bring you out of your dry season. Father God, thank you for revealing yourself to me through these attributes – Your Sovereignty, Your Immutability, Your Omniscience. Thank you for the rest I can have in you. Knowing that you are in full control of everything that happens gives me rest from my toiling. Renew me according to your word and the scriptures I just read. During this week help me to be refreshed as I think about you and I reflect on your attributes, Amen.